Evan Thomas Creek is a very nice climbing area with just 1 hour approach along a beautiful creek and no avalanche danger. 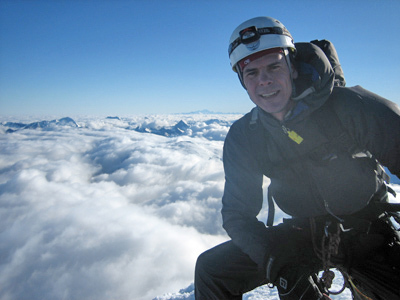 Today I went there with David Brauner, Martin Ploug and Carlos Buhler to climb in the Moonlight area. I had expected to climb some of the three routes in the guidebook [Moonlight (WI4), Snowline (WI4) and 2 low 4 zero (WI3 R)] but when we got there Carlos spotted a potential new mixed route left of Moonlight..... We went up to look at it and decided to give it a go. Even before we began climbing the route it was obvious that the crux would be to protect to rock sections as the rock was of poor quality with few cracks to put pro into. However, the climbing was newer difficult - just mentally demanding. As I led the first pitch which climbed a rock corner for 10 m with reasonable small ledges but poor rock and lousy protection I took comfort in the deep snow field below - a nice crash pad! 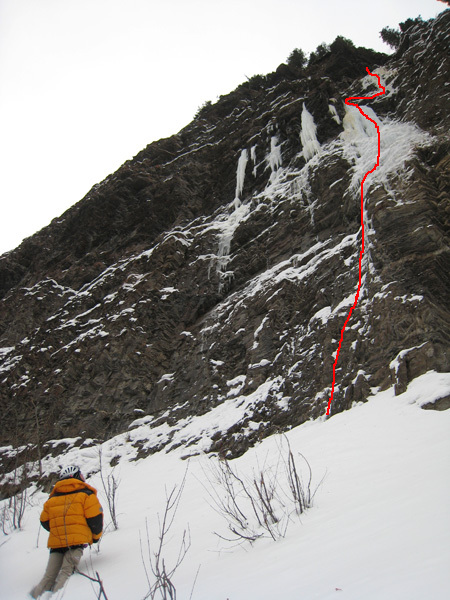 The rock led to an ice smear that gradually got thicker for 10 m until I reached a thick vertical pillar. I put in a stubbie ice screw as soon as the ice go thick enough which was a really nice feeling - the first pro I trusted! 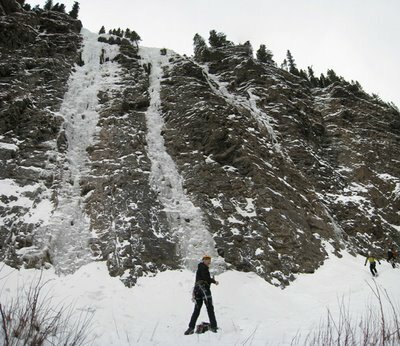 I then established a hanging belay on the top of the ice pilar. Carlos then led a sketchy traverse on poor rock and moss (!) with lousy protection until he reached a thin ice smear which gradually got thicker. He also put in a stubbie as soon as he could, but had to tie it off as the ice was not thick enough! I liked his comment "You have to be pretty desperate to climb on that!" where after he put in another tied-off stubbie and continued upwards! He established the second belay at the top of the ice under a rock overhang from where we rapped the route. After we returned home we asked around whether the route was new or not. Sean Isaac commented that it might be Cry of the Snow Lion (M5, 55m) which was climbed in 2005 but as we didn't see the pin anchor they had made we don't really know. We also suggested the grade M5 (but with a R due to the lousy pro) and called the route Luna with reference to the Moonlight area and my dog! New route or not - it was a great adventure with a Scottish alpine feel to it! You can read about the new route or not discussions here. Carlos in front of the route we climbed with line shown in red. 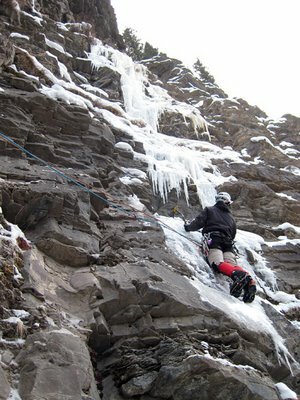 Carlos on thin ice on the second pitch just after the sketchy rock/moss traverse.